The MCP Guidance System is a Holland career self assessment test that provides information on interests, values, skills, personalities, Holland Codes, 1200+ occupations, and 6000 schools. I like the option of answering beyond just "yes I like it or no I don't like it." Most programs limit the options to just the two. 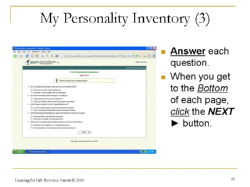 The My Interests Inventory generates a 3-letter Holland Codes and provides Interest Level Scores for the six (6) Holland Personality Types. The Inventory provides a detailed description for each of the Holland Personality Types. The Interests, Skills, Values, and Personality Inventories generate Occupational Lists. 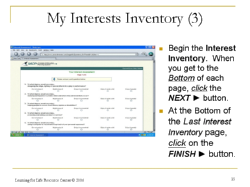 You can access, review, and redo the Interests, Skills, Values, and Personality Inventories. Do you want to go to college in a large city, large town, or rural area? Find a college that matches your criteria! The States section allows you to select a college from a specific state. How much do you want to pay for tuition? What is your preference for the number of students enrolled at the college? 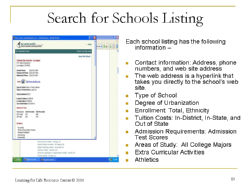 The Enrollment and Costs sections outline detailed school information that matches your criteria! 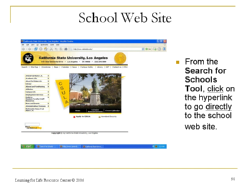 Find the school that meets your needs. The Type of School section selects schools that match the factors that you select. 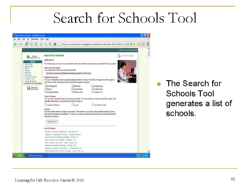 The Schools can be saved to create a Custom School List. All lists can be printed and saved for future reference. 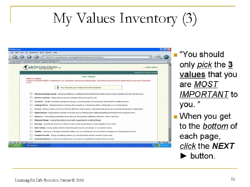 The My Values Inventory provides a detailed description for each of the Values. The My Values Inventory matches occupations to your Values and generates Occupational Lists. 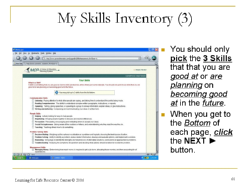 The My Skills Inventory provides a detailed description for each of the Skills. The My Skills Inventory matches occupations to your Skills and generates Occupational Lists. Discover your Personality. My Personality Inventory assesses your personality, matches occupations to your Personality, and generates Occupational Lists. 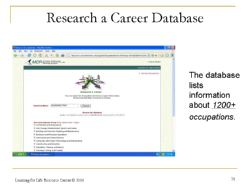 In the My Career Profile Guidance System, the Career Exploration Tools include the Research a Career and Combining Your Assessments Tools. Complete request for bulk price sheet.